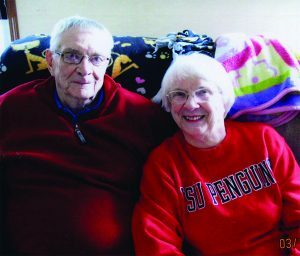 Since 2013, YSU Magazine has been sharing married YSU couples’ love stories in our popular “Penguin Mates” feature. The couples featured below were introduced in the magazine’s Fall 2016 print edition – you can read their complete stories and see all their photos here. Don Seely, ’58 BA in History, and Barbara Wentz Seely, ’58 BA in Mathematics, ’84 BS in Computer Science, were married Aug. 22, 1958. 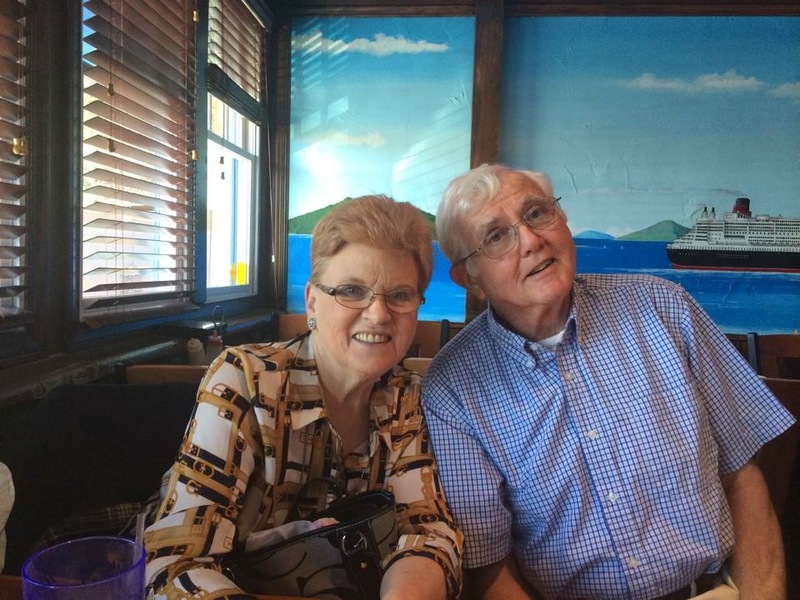 He earned a law degree from the University of Akron and is retired from a 47-year law practice; she taught math in the Poland Schools and at YSU. They live in Poland. How we met: We met around 1955 at Youngstown University through mutual friends, and our first date was a YU football game. 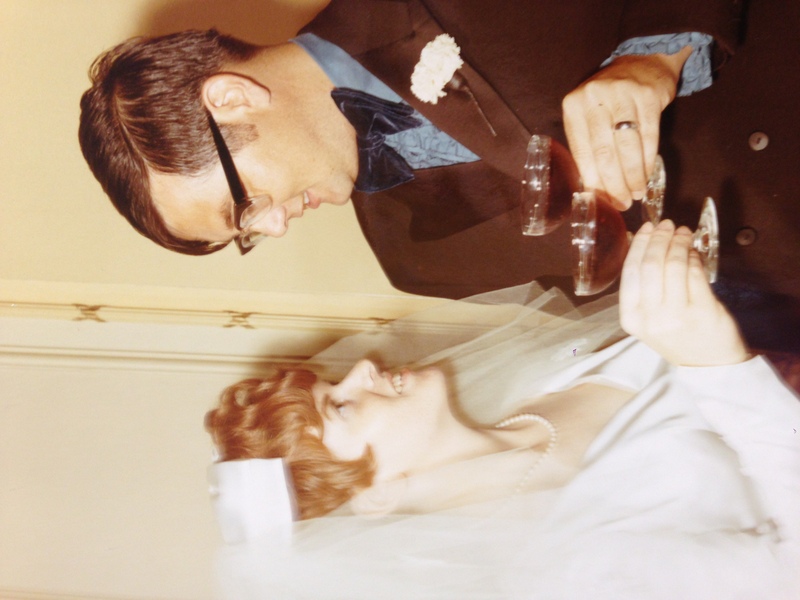 Don was a member of Pi Beta Chi fraternity, now TKE, and Barb was a member of Beta Sigma Omicron sorority now ZTA. Don served a semester as president of the Student Council; Barb served a year as Pan Hellenic Council president and was one of the first students initiated into the Gould Society. Don and Barbara both graduated in June 1958 and both were YU pin winners. They were married Aug. 22, 1958; Don served in the U.S. Army and went on to earn a law degree from the University of Akron. He practiced law for 47 years, serving as village solicitor for Poland and New Middletown, as well teaching part-time at YSU. Barbara went back to school and earned a second degree, a BS in computer science from YSU in 1984. The Seelys have two children and six granddaughters. Most of their travels are to visit their son’s family in Oklahoma or their daughter’s family near Cleveland. Residents of Poland for 58 years, they are active members of Prince of Peace Lutheran Church in Poland, where Don serves on the church council. 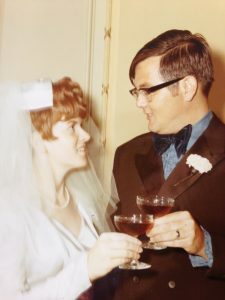 J. Robert O’Donnell, ’70 BS Industrial Marketing, and Leslie Knoll O’Donnell, ’69 Early Childhood Education, were married June 27, 1970, in Pittsburgh. They live in Marietta, Ga. He retired in 2007 from the McNichols Co. as a Senior Management Engineer; she retired in 2002 after 27 years as a teacher in the Cobb County Schools. How we met: Bob and I met a day or two before school started in 1968. He was playing football with the guys who were all returning to school that semester; I was living at Lincoln Towers and had gone to town with a few of the girls. It began raining so my friend suggested we go over to the Y where some of the guys lives to see if we could get a ride up to the dorm with BO – that was Bob’s nickname. He had a car, and that was a big thing then. The guys were all muddy, but Bob did give us a ride to the dorm that night. Bob lived in Pittsburgh, and so did I, so I was able to get him to take me home on the weekends. Before that I was riding the bus back and fourth. We dated for a year or so, then got engaged. He took a job at Wheeling Pittsburgh Steel and I worked as a teacher in Youngstown teaching to finish the school year. We married in Pittsburgh in the summer of 1970, and then moved to Wheeling W.Va., where I taught school for seven years. One of Bob’s bosses took a job in Georgia to help start a new company and asked Bob to join him. We were also in the midst of adopting a child at the time. The adoption happened very quickly – we sold our home, received our baby, flew to Georgia, bought a house in a day and moved within two weeks. I taught elementary school for 27 years in Cobb County, Ga., retiring in 2002. Bob worked for the new company until it closed in 1988, then he went to work for the McNichols Co. until his retirement in 2007. We’ve enjoyed doing some traveling since then and now have my 97-year-old mother living with us. Bob works part-time a driver for a Goodyear Store and I do some pet sitting, along with caring for my mom. Steve Barber, ’85 BA in Political Science, and Valerie Vasil Barber, ’86 BS in Business Education, were married August 23, 1986, in Hermitage, Pa. They live in Jeannette, Pa. He is a store manager with Rite Aid; she is a home economics teacher at Jeannette McKee Middle School. In August they celebrated their 30th wedding anniversary. How we met: Steve was a member of the ROTC, and I was a featured twirler in the marching band, and we had noticed each other a few times before actually meeting in the spring of 1983. He was a commuter student at the time, and I lived on campus at Buechner Hall. We went out a few times; then parted ways, but met up again in the fall of 1984. Steve graduated in 1985 with a BA in Political Science and received his officer’s commission, and then started his military career with the 1/229th Field Artillery Unit in the Army National Guard in New Castle, Pa. 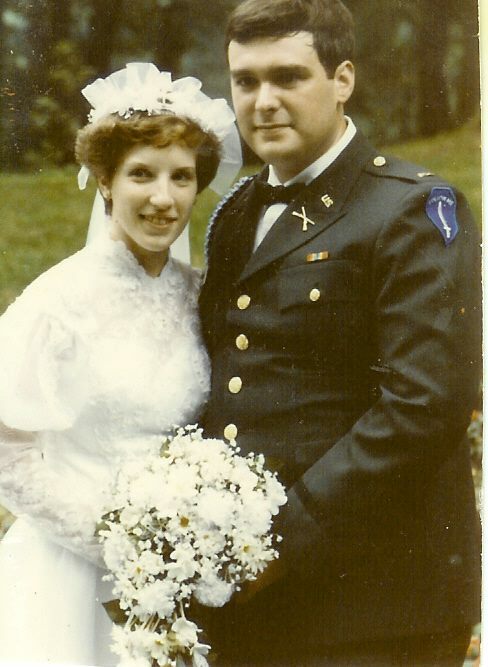 I graduated in June 1986 with a BS in Business Education; we had a military wedding two months later on August 23 in St. Michael Byzantine Catholic Church, Hermitage, Pa. Two days later, I began my teaching career as a high school Business teacher in the Noble Local School District, Sarahsville, Ohio. Meanwhile, in addition to the National Guard, Steve started his retail management career with the former Hills Dept. Stores. Early on he was relocated several times with the company, so I stopped teaching after two years, and we started our family. Our daughter, Anna, was born in 1988, our son, Alex, in 1992. By our tenth anniversary, we had settled in Jeannette, Pa. where we have lived for the past 20 years. Steve is a manager with Rite Aid, and I am the Home Economics teacher at Jeannette McKee Middle School. I returned to teaching in 1998 when our children were in elementary school. Our son is also a YSU graduate – he earned an AS in criminal justice in 2013 and is now a police officer. 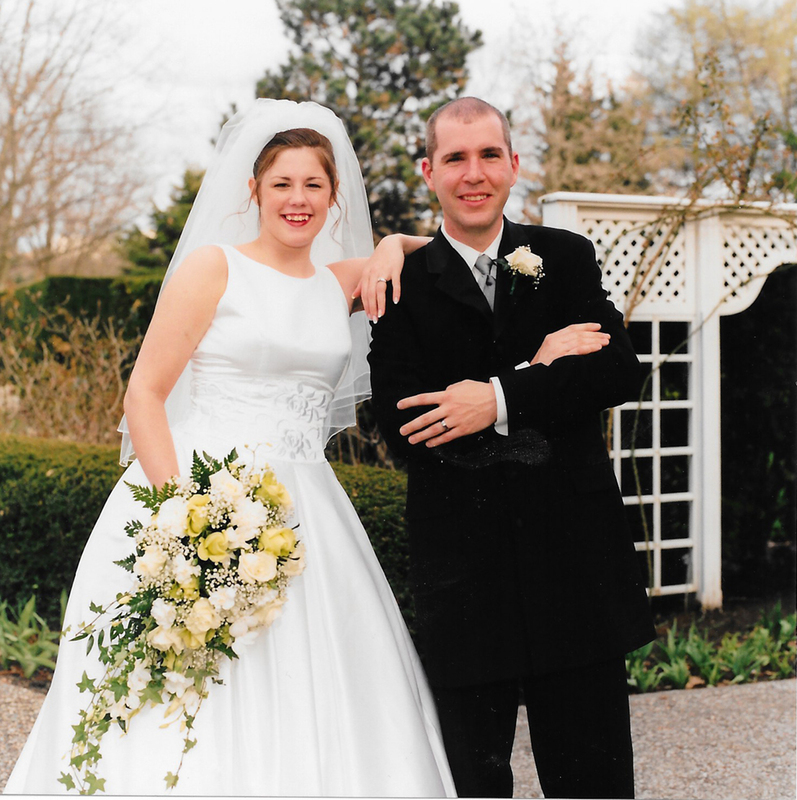 Michael J. Sweeney, ’00 BS in Criminal Justice, and Marnee Csejtey Sweeney, ’00 BS in Elementary Education, were married April 13, 2002, in Youngstown. 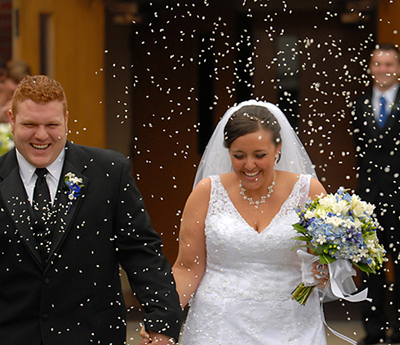 He works for Boardman Township; she is a fifth grade teacher at Youngstown Community School. They live in Boardman. How we met: We first connected at the SAE table in Arby’s in Kilcawley Center. Michael was deployed with the National Guard 838th to Germany, and when he returned a wonderful relationship of almost 20 years began. 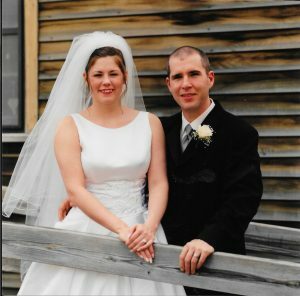 We were married April 13, 2002, in Youngstown at St. Patrick’s Church. He works for Boardman Township and I am a fifth grade teacher at Youngstown Community School. We live in Boardman with tour 11-year-old daughter, McKenna. 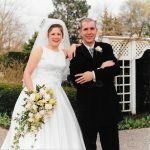 Chris Crilley, ’04 BA in Political Science, and Gina Grapevine Crilley, ’05 BSEd, were married April 22, 2006 and celebrated their 10th anniversary this year. He is a home office property specialist for Grange Insurance; she is a Boardman High School teacher. They live in Poland. How we met: My name is Chris Crilley. When I and my wife, Gina (Grapevine) Crilley, attended YSU, I was a member of the Sigma Chi fraternity and Gina was in a sorority, Zeta Tau Alpha. We met in the “Ice Castle” at a YSU homecoming game in 2001. The rest has been history, and YSU has played a huge part in both of our lives. I graduated in 2004 with a BA in Political Science and I am currently employed by Grange Insurance as a Home Office Property Specialist. Gina graduate from YSU in 2005 with a BS in Education and is a teacher at Boardman High school. We were married April 22, 2006 and celebrated our tenth anniversary this year. 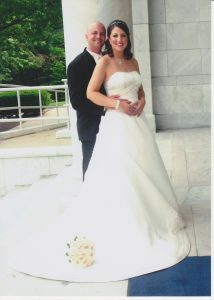 We actually took some of our wedding photos on the YSU campus, including on taken in front of the “Rock” after it had been painted for us by Gina’s sorority sisters. We have two wonderful children, Connor (6) and John (4), and we live in Poland. 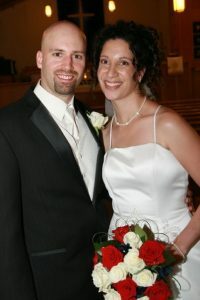 Michael Edward Faber, ’97 BS in Combined Sciences, and Catherine Faber, ’08 BSAS in Information Technology, were married July 4, 2008, in Brookfield, Ohio. He earned a Chiropractic degree from Southern California University of Health Sciences and is a chiropractor; she is an operations analyst for an IT company. They live in Cuyahoga Falls, Ohio. 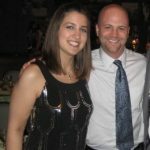 How we met: Catherine is an Operations Analyst for an IT company and Michael is a Chiropractor. He received his Chiropractic Degree from Southern California University of Health Sciences, where he graduated as valedictorian. We live in Cuyahoga Falls, Ohio, with our three children: Mikey, Emma and Maggie. 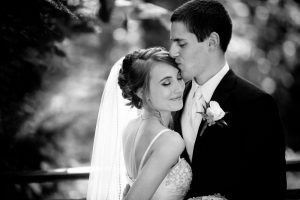 married September 12, 2009. They live in Cortland, Ohio. Alex is a rubber development chemist for Goldkey Processing in Middlefield, OH since 2009; she earned an MS in Nursing from Ursuline College and is a Family Nurse Practitioner for Mercy Health in Radiation Oncology. How we met: When they first started dating, Alex and Sevasti both thought that they initially met in Cafaro House where they lived as University Scholars. However, they eventually realized that they had met before their first semester even. When they were awarded their scholarships, they were called to the Kilcawley stage alphabetically by last name to receive them. They were standing right next to each other as newly introduced USXI’s when they had their very first picture taken together. They were unaware that, six years after this first meeting, they would be introduced as husband and wife. On their fourth wedding anniversary in 2013, they welcomed their beautiful daughter Emelia into their lives. 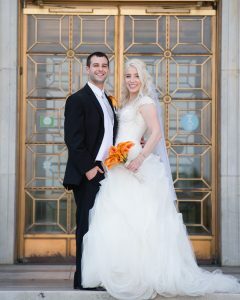 James Kosek, ’11 MSEd in Education Administration, and Jessica Mularchik Kosek, ’06 BSEd in Middle Childhood Education and ’11 MSEd in Curriculum and Instruction, were married June 12, 2010. They live in Struthers. He is a social studies teacher at Discovery School at Kirkmere, part of the Youngstown City Schools and serves as a member of Struthers City Council; she is a Title I teacher for the Poland Schools. How we met: We met while taking a Statistics course in grad school at the Beeghly College of Education. I sat behind Jim in class and we finally went on a study date for the final. Now we live in Struthers with our daughter, Chloe (2), and pet boxer (Bear). Jim teaches seventh and eighth grade Social Studies at Discovery School at Kirkmere in the Youngstown City Schools. I am a Title I teacher for the Poland Schools. Jim is also a member of Struthers City Council. We were married for six years in June. Mike Adamson, ’12 BE in Chemical Engineering, and Alyssa (Krumpak) Adamson, ’11 BS in Mathematics, were married at the Butler North Church in Youngstown on September 5, 2015. He works as a process engineer for Omnova Solutions in Akron. She earned a MS in Statistics from The University of Akron in 2013 and is now employed as a channel analyst for American Greetings Corp. in Cleveland. 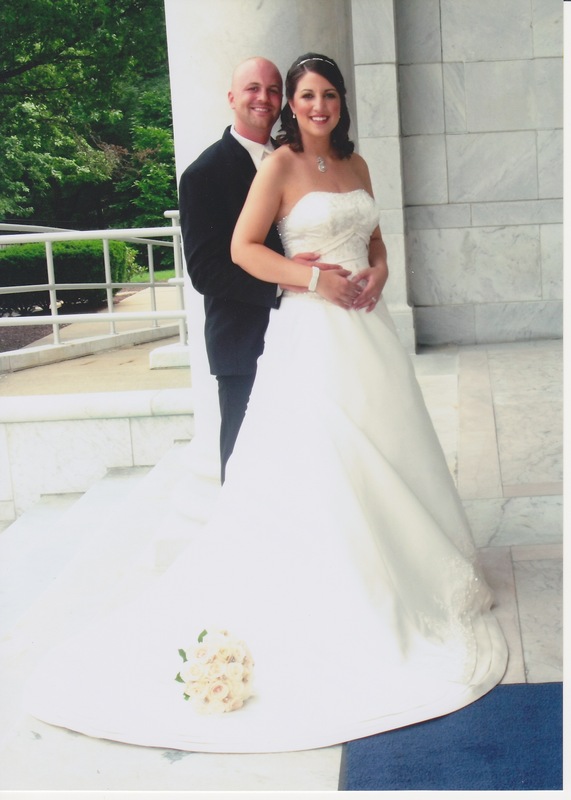 How we met … We met at YSU in the spring of 2009 at Mike’s fraternity house, Sigma Tau Gamma. I was an active member of Zeta Tau Alpha sorority, so we saw a lot of each other while we were enjoying various Greek Life activities. We were friends for two years before officially starting to date in May 2011. Since graduation, Mike has remained an active Sig Tau alumnus and I have remained an active Zeta alumna and collegiate advisor. 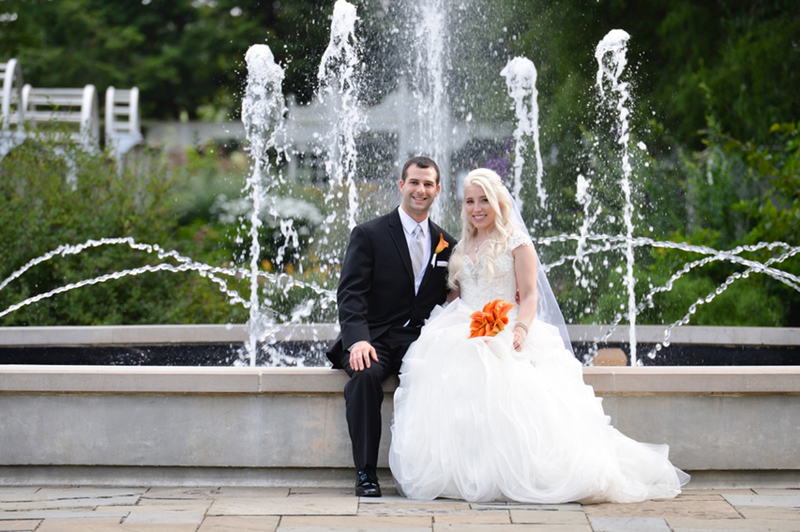 It meant a lot to us to be able to get married where it all began – right on campus! Over half of our bridal party consisted of fraternity brothers and sorority sisters and we really enjoy being able to share our Greek Life experiences, memories, and friendships with one another. 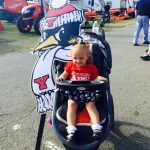 We now reside in downtown Cleveland and enjoy cheering on the city’s major sports teams, but we often come back to Youngstown and YSU to visit with family and participate in YSU, ΣTΓ fraternity, and ZTA sorority alumni events. Michael Metzinger, ’12 BSBA in Accounting and Finance, and Ashley Kent Metzinger, ’15 BS in Middle School Education, were married September 26, 2015, in Boardman. He is a senior accountant and a certified public accountant at Hill, Barth & King LLC in Canfield; she is a fourth grade teacher at St. Rose Catholic School in Girard. They live in Boardman. How we met: We met on campus one evening in 2012 when Ashley, who was a student assistant in the YSU Athletic Department at the time, was assigned to work in the elevator at Stambaugh Stadium for an Ursuline High School football game. We soon became good friends and later started dating. We were married September 26, 2015, at St. Luke Catholic Church in Boardman. Our reception was held at Our Lady of Mount Carmel Hall in downtown Youngstown. 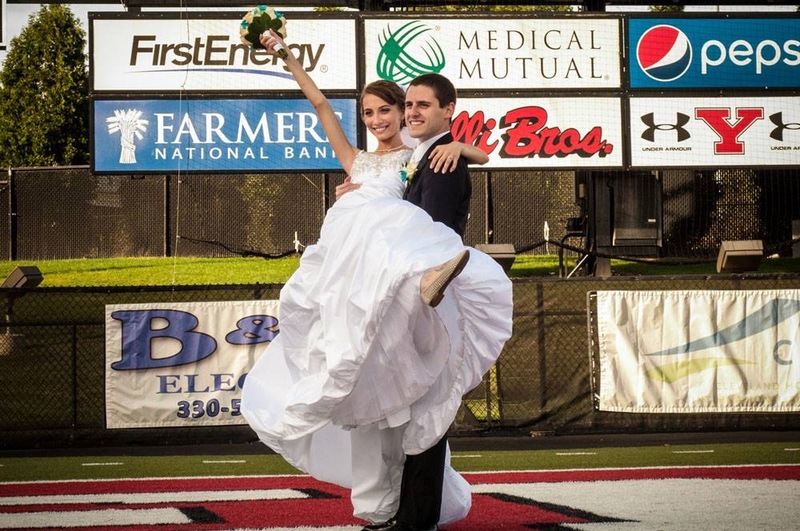 Between our wedding ceremony and reception, we stopped to take pictures on the field at Stambaugh Stadium because we are both proud YSU graduates and that is where our relationship began. 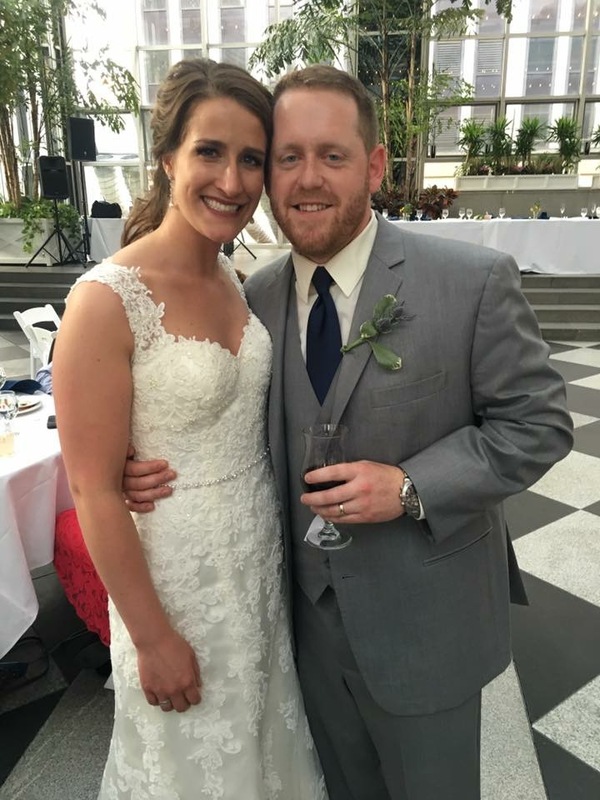 Michael Grumley, ’09 BE in Civil Engineering, and Kate Bonn Grumley, ’10 BE in Civil Engineering, were married May 28, 2016, in Pittsburgh. They are both employed as project engineers for FedEx Ground and live in Pittsburgh. How we met: Michael went to Girard High School in Ohio and I went to Bethel Park High School in Pennsylvania. We met at YSU in 2008. Michael and I had a few civil engineering courses together, but he first approached me to ask if I wanted to paddle on YSU’s concrete canoe team. Crazy concept, right? We were friends in college and our canoe team qualified for the National competition, but we never dated. Fast forward to 2012, and it was the University of Pittsburgh’s turn to host the American Society of Civil Engineers’ concrete canoe competition. A bunch of the former paddlers got together in Pittsburgh to support the YSU team, including Michael and I. Quite simply, it was the right place at the right time. We immediately started dating and three years later he proposed. 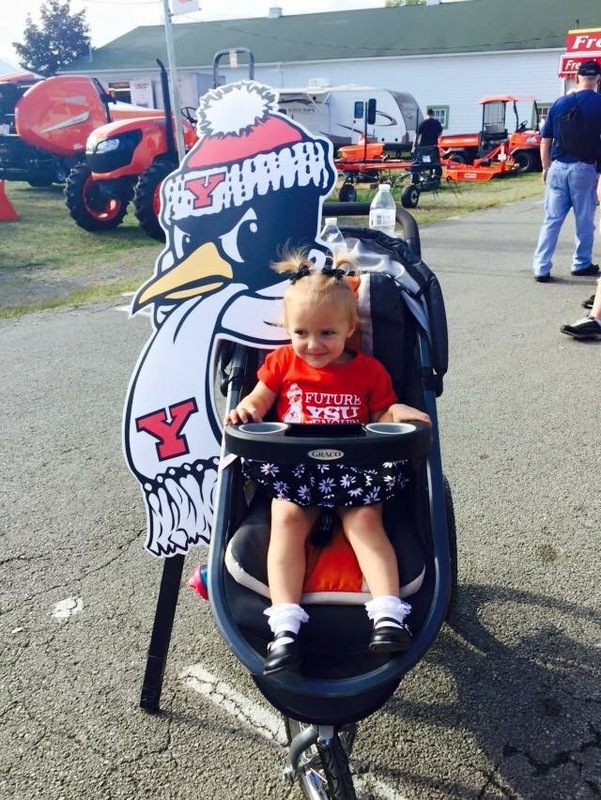 We love going back to YSU, especially for Homecoming each year. We are definitely proud to be Penguins! 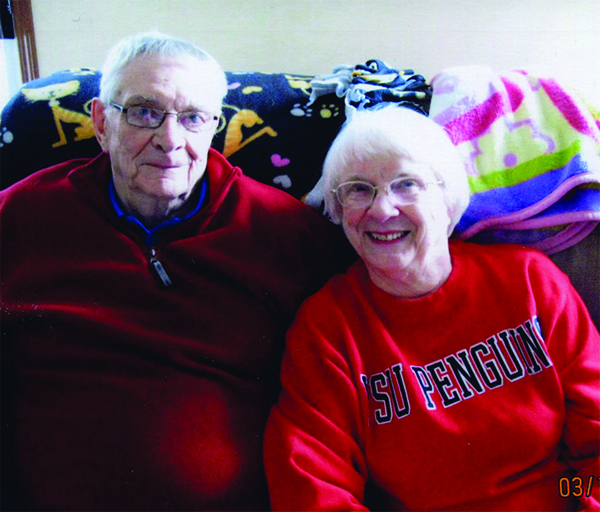 If you and your spouse are both YSU graduates, let us share your story in Penguin Mates. Tell us how you met, and a little about your life today, in 300 words or less, and email or mail with a current photograph and/or a wedding photo. Be sure to include your degrees, graduation years, city of residence, an email address and phone number so we can contact you. Email to cevinarsky@ysu.edu or mail to Editor, YSU Magazine, Youngstown State University, One University Plaza, Youngstown, OH 44515.